The truth is I come to India for the tea. Just kidding. The real truth is I come to meditate at the Dakshineswar temple of the Yogoda Satsanga ashram, the Indian wing of the Self Realization Fellowship. It’s north of Kolkata along the Ganges. There are about three monks that live here, several brahmacharis (monks in training) and retreatants from all over the world. The temple faces the Ganges. The marble tiles across the portico remind me of a front porch of a grand Southern mansion. The pillars start out as classic Greek and then explode into ornate Indian carvings at the top. The little blue temple is narrow—only five people across can sit on faded orange wedge pillows laid in orderly rows on the dark blue carpet. The windows go from ceiling to floor. Tiny mahogany meditation chairs (for the foreigners) look a bit austere but are surprisingly comfortable. In the distance a ferry boat put puts across the Ganges taking passengers to and from their work. It has the same sound as the Evinrude motor on my dad’s fishing boat some 40 years ago. I would know that engine anywhere. Here I can corral my wild stallion of a mind easier than anywhere else. Great souls have meditated here and still do every day. they sprinkle their love and devotion on this temple– not visible, but as real as the scent of river on the breeze. I am deeply content here—not new dress happy, not great restaurant satisfied, but a clarity that truly feeds me. Last night, all over India, it was Divalli holiday. Everywhere in the city, lights are hanging from the roofs of buildings, paper and fabric temples erected to honor the mother. Divalli celebrates the birth of the Goddess, Kali. That’s about all I know about it. You could feel the excitement building even a week ago in Jaipur where our drivers were talking about the shopping they needed to do. Sound familiar? One more element of Indian holidays that is more over the top than anything else—a love affair with fireworks. All day long the maintenance crew was spiffing up the ashram and putting candles out– on the fountain, every railing, along the walkways and fish pond. Families began to appear about 5 PM. We did our normal exercises on the portico and went in for meditation. While we were meditating, the children and maintenance men began lighting the candles. When we came out, it was magical. Everyone gathered in the courtyard and soon fireworks were exploding. The monks and adults were as excited as the children. For me, the most outstanding part of the whole event was that the maintenance crew (low members of the social totem pole) were the heroes—managing the fireworks. One of the men even made all the big elaborate ones. Yogananda’s picture was in the center of the fish pond The finale was almost 2 stories high and reflected off the water. Prasad (a special blessed treat) was then passed out. The whole evening had almost a feudal feeling —where people brought their families to share with other like minded people and the ashram provided it all. PS My camera has a setting for fireworks. This is what turned out,. Interesting huh? Internet is crappy. Even the hotels that say they have good connection, don’t really. Pls excuse the grammatical mischief. Today I walked in cow dung in streets so narrow you could barely get a motorcycle thru and watching a motorcycle get around a cow was quite entertaining. I visited an ashram that existed more than 200 years. I had the best food in all of my time in India and squatted to pee in a bathroom too gross to describe. I bought silk sheets for less money than the one day sale at Macy’s. 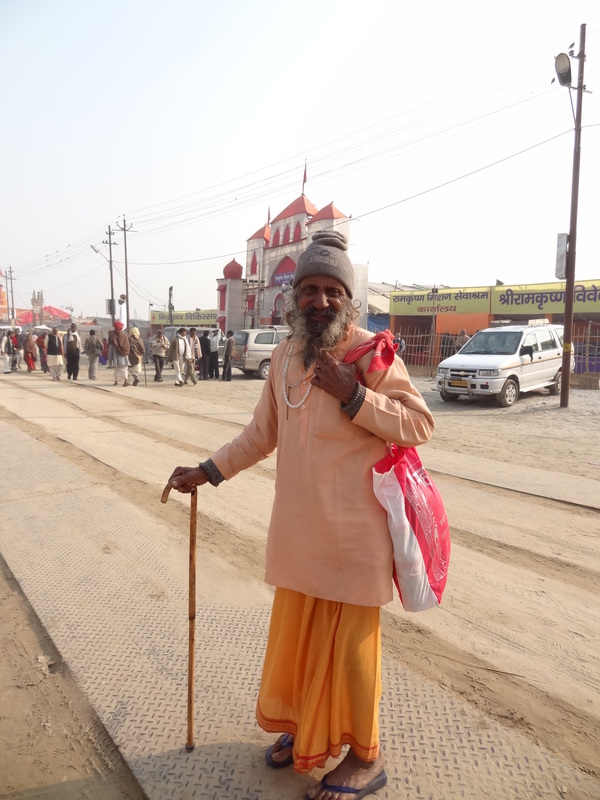 Old men smiled at me with the red betel juice between their teeth I floated down the Ganges River at sunset while thousands of pilgrims on shore sat on the steps of the ghats and sang “aarti,” devotional chanting and the lighting of candles. Varanasi which was previously called Benares and centuries ago was known as Kashi is the oldest city in the world. This city of Light is a vast crowded landscape and at the same time a deeply moving spiritual center– a microcosm of India. It is a shadow play between the both mundane and sublimes played out at the ghats, stone steps and walkways, along the river. Along the shores are ancient castles and estates that over centuries the wealthy and privileged have built so that they could come to this most holy of places to die. It is believed that to die in Varanasi greatly improves one’s soul’s progress. Over centuries India’s great souls have inhabited this city—Ananda Mai Ma, Babaji, Lahiri Mahasaya, Buddha, Trailanga Swami and some say Jesus visited here. At twilight there ia moment of complete stillness when the sun sets over the river. Boats are lined up filled with many international tourists but mostly with Indian pilgrims who have come here at great sacrifice. They float little flower packets down the river to ask the blessings of Mother Ganga. Light on the temples domes heart stopping. I am sitting in the colorful gardens of the Yogoda Satsanga Retreat Center in what used to be the village of Dakshineswar, but today we would probably call it a suburb of Calcutta or, more correctly Kolkata. My spiritual teacher for the past 30 years, Paaramahansa Yogananda, bought this property in 1939 with the help of his disciple, Rajarsi Janakananda. There is a Ramakrishna ashram, Yoga Math, for women just down the road with stunning architecture. Dakshineswar is a pilgrimage site where India’s great Kali temple honoring the Divine Mother is located. 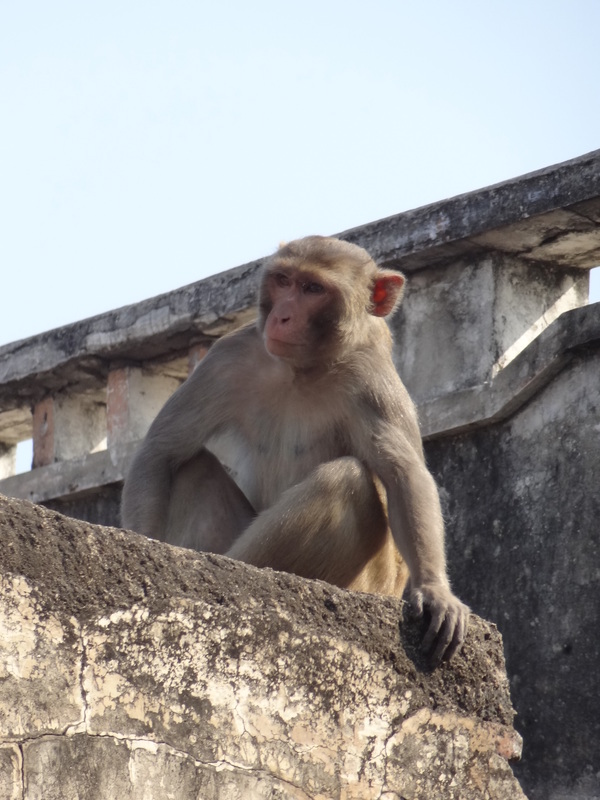 India is always loud and noisy, but there’s a stillness in the ashram so tangible I can almost taste it on my lips. Several times a day I can hear the Muslim call to prayer from across the river. Dogs in the street bark and horns blare. In the background is the constant putt putting motor of the ferry crossing the Hoogily River leaving the scent of diesel fuel in its wake. It sounds like it’s on its last legs, but it sounded that way three years ago when I was here. I swear it is the same Evinrude motor as my father’s old fishing boat. I would know that sound anywhere. Like a beautiful southern mansion, the temple building is white with dark blue trim. Marble tiles cover the portico across the front. Pillars have a stately Grecian feel but then explode into exotic Indian carvings at the top. Intricate lattice work make up the railings. We meditate every morning and evening. All my worldly obligations are put aside for awhile—stealinig time from maya. I feel I am stashing money in the immortality bank. Sitting in the silence with the Master by my side. When my thoughts have gone to rest, that’s the time I see Him best. The words of this chant keep running through my head. Thirty years of meditation attempting to calm the mind, and here it happens easily. I am divinely happy –not full stomach satiated–not bought a new dress happy– not in any way sensually satisfied– but a deep, sing for joy contentment. The plane touches down at the dinghy Kolkata airport. We gather our luggage and go through customs standing in line until various uniformed characters study our passports and visas, grunt and pass us on to the next official who does the same thing. We push our luggage cart to the exit door where a sea of taxi drivers are all eager to drive us into the dark night. A moment of doubt and hesitation– the adventure begins. India is a difficult place to travel. The pollution is teetering at an edge that’s not sustainable–the impact of a billion and half people and intense growth. The water quality so hard for foreigners, the noise, the traffic, the dusty streets and constant hustle. With all these challenges, why would anyone in their right mind want to come here? Because Mother India isn’t about the mind, she tugs at one’s heartstrings even from 7000 miles away. I’m not denying that the poverty of India isn’t shocking, pervasive, heart breaking, but I don’t much focus on that. The people of India are industrious, creative. They come up with the most ingenious solutions to problems that we have long since solved with money and technology. Today I saw a water system work with a couple of bamboo poles and rope. I love how the people of India, of course not all, have nothing compared to our lifestyles, yet they know how to be happy and content. I love how curious and open and ready to break into a smile they are. I love how proud they are of their country and the progress it is making. I love how, as older people, we are so honored, respected and actually looked out for. I love how devotional they are and not afraid to share it. Most of all, I love their 5000 year old tradition of yoga and spirituality; the science of going beyond our limited minds to experience what every religion in the world has written about but doesn’t practice much—experiencing the peace that passes all understanding. And besides, India is never boring. There’s always some surprise around the corner. Kep is a quiet seaside retreat not so much discovered, as yet, by the tourists. Its beaches are not that great. The seafood is more than abundant and crab is their specialty. We splurged ($25) on a guesthouse with peach colored bungalows and thatched roofs. A deep blue pool is surrounded by terra cotta tiles. Organza curtains flutter around the bamboo gazebo. It’s hot and humid here, but this was one of our best days in Cambodia. Lush is an understatement for this tropical region. There are jack fruit and mango trees. The palms fronds flap their leaves together in the ocean breeze. A fragrant six- foot jasmine like bush grows nearby. The mountains inland are a national park. Cambodia is still more 19th than 21st Century. The young man that lives down the trail beyond our resort passed by this morning on a farm wagon still pulled by oxen. David and I rented a motorbike this afternoon and cruised the newly resurfaced roads near the ocean. There are many 1-3 acre parcels where once stood lovely seaside mansions during the French Colonial era—some of them designed by architect, Le Corbusier. They were destroyed by the Khmer Rouge in the 1970’s and 80’s. Many peasants have taken over the parts that are livable. Beautifully crafted stone fences and elaborate iron gates still remain. Mature landscapes have returned to their wild and natural inclinations. Someone or agency is busy clearing the lands and hanging for sale signs so if you know of anyone looking to build their seaside villa on a bargain piece of land, this might be it. Of course, to get here, we endured a two-hour spine jarring tuk tuk ride on a road in process where, when someone passed us, we had a brown out of red dust. Yesterday we ate Green Papaya Salad and Crab cooked in Coconut and Lemon Grass sauce. 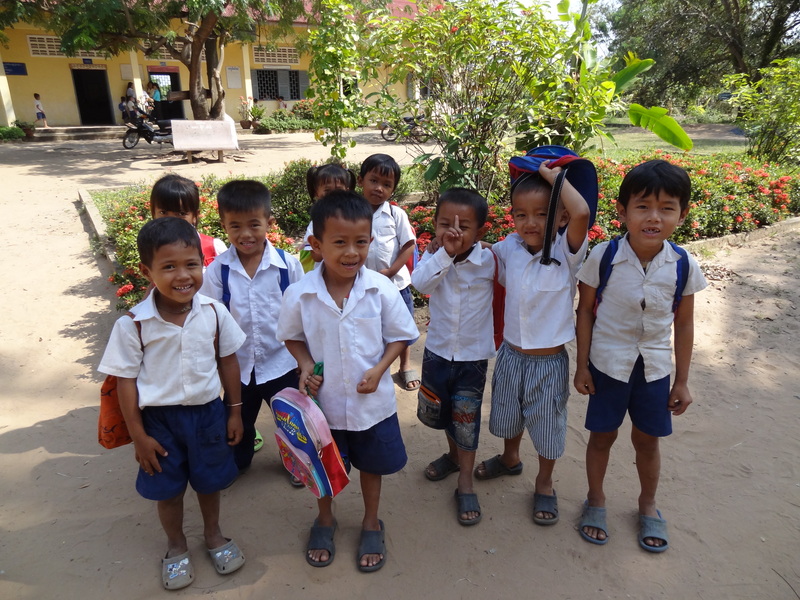 I love the Cambodian people especially in the countryside. They don’t need to meditate—so easy going and ready with smiles. When I ask a driver how much to pay for some extra service he gave us, he smiles and says, “Oh, you decide, madame.” No haggling. Les Manguieres is a resort I found on the internet . . .”one of Cambodia’s best kept secrets”. And indeed it is. The resort is on the Kampot River about four miles out of the town of Kampot and about 15 miles from the ocean. It is best known for its red, green, white, and black peppers that grow on nearby plantations in the foothills of the mountains. The assistant manager of the resort, a Cambodian woman who looks about 16, helped us arrange a biking and kayaking excursion on our first day there. Our plan was that we would ride their bikes about 3-4 miles through the local village; then meet the resort’s boatman who would ferry a kayak up river to us. The bicycles were rusted, one gear Chinese specimens probably manufactured during the Ming Dynasty, but they worked. With her carefully drawn map in hand, we rode through the village accompanied by curious young boys pointing the way to the confused looking “farangs” or foreigners. We arrived at the local school just as the kindergartners were getting out. It looked much like our schools, but parents waited on motorbikes squeezing up to three little ones on for a ride home. “Hello!” Hello!” they called; little hands waving. It was my movie star moment as the gappy toothed kindergartners gathered around my bike to see themselves in the pictures I took. Their innocence and unadulterated joy was worth the price of the plane ticket. We rode on to the third bridge where our boatman was waiting. 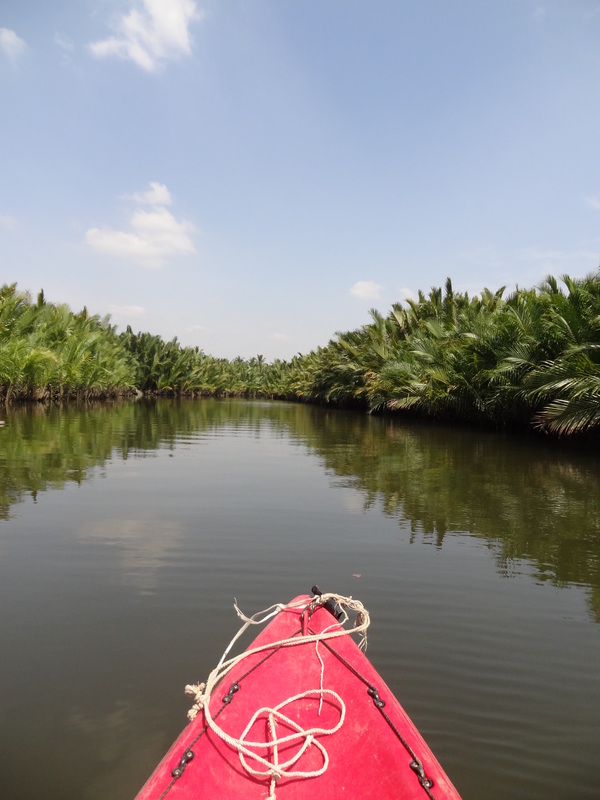 With a chorus of birds to accompany us, we paddled first into the mangrove backwaters that the locals call the Green Cathedral; then out into the open river for a much needed dip. A smiling, toothless grandmother came out to wave at us, and other local children splashed into the water as well. I know I sound a little spoiled but the Cambodian version of a kayak is more like a small bathtub which works if quick turns aren’t required. The main diet here is fish as well as rice, watermelon, mango, pineapple, and bananas and of course, pepper. The broad, salt water river is teeming with fish of various kinds unlike our own. It is so hopeful to see a river that actually feeds its community. These Chinese grapes were were so voluptuous looking that we had to buy them. Only when we got back to guesthouse to we calculate that 180 Baht was $6. 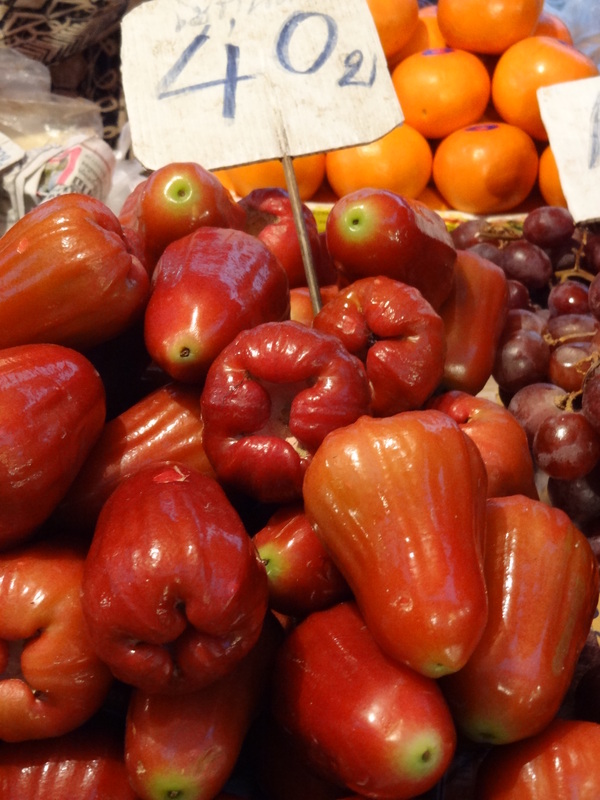 Oh well Also tasted a small, shiny red pepper like fruit–tasted like a cross between a cucumber and rhubarb. It was called som man uoo. Well, something like that. No we did not taste those lovely pricey-looking ones.